Combine marinade ingredients in small saucepan over medium heat, whisking until blended. Place steak and 1/3 cup teriyaki mixture in plastic bag; turn steak to coat. Close bag securely and marinate in refrigerator 30 minutes, turning once. Reserve remaining teriyaki mixture for sauce. Remove steak from marinade; discard marinade. Place steak on rack in broiler pan so surface of beef is 3 to 4 inches from heat. 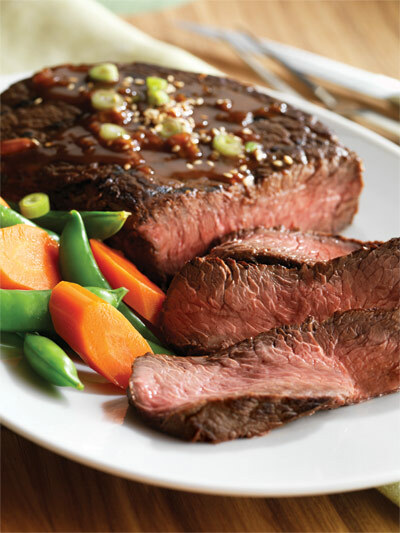 Broil top sirloin steak 16 to 21 minutes for medium rare to medium doneness, turning once. Meanwhile, add water to reserved sauce in saucepan; bring to a boil. Reduce heat and simmer 12 to 15 minutes or until slightly thickened, stirring occasionally. Carve steak into slices. Serve steak with sauce. Cook's Tip: To grill, place steak on grid over medium, ash-covered coals. Grill, uncovered 17 to 21 minutes for medium rare to medium doneness, turning occasionally.